Hahnenwasser Hassles | As I blog. 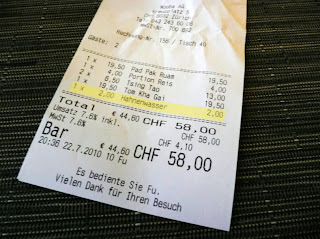 One of the most annoying things about Zurich is the lack of table water provided at most restaurants. It's always nice not to have to ask for something, but when you explicitly request hahnenwasser (tap water), it's been more often the case for me that a waiter will bring a 5CHF bottle of something fancy and open it before I have a chance to argue. Or they will say they don't serve hahnewasser, or they have to charge for it. I understand that the service industry is different in Europe than it is in United States. I am accustomed to the campy customer-is-always-right-your-wish-is-my-command attitude, along with frequent check-ins to make sure I don't want a refill, and that everything is alright -- with me, my food, and my life (superficially). This is not what I expect, nor is it what I necessarily want, but come on... no free tap water?! Even France, a country regarded as having less-than-charming service, always has a carafe of water at the table when dining. Ignoring the additional cost, all of the extra bottles are just unnecessary waste. And the irony is that once you leave a restaurant in Zurich, you have 1200 public water fountains awaiting to quench your thirst. I've learned to live without ice, even when it's not included in an "ice tea", but this custom is one that leaves me dry. Literally.